Cowboys come in all shapes and sizes. You've got your big, stocky gunslingers that seem larger than life. There are also plenty of small, wiry cowpokes that look like a strong breeze could blow them away like a tumbleweed. It didn't much matter how you looked in the old west as long as you could hold your own out on the range, and in the saloon afterward. But, there were a few things that could help build your reputation as a tough guy, like a big hat, some fancy horse riding skills, and a quick trigger finger. Also, it didn't hurt to have an amazing mustache. 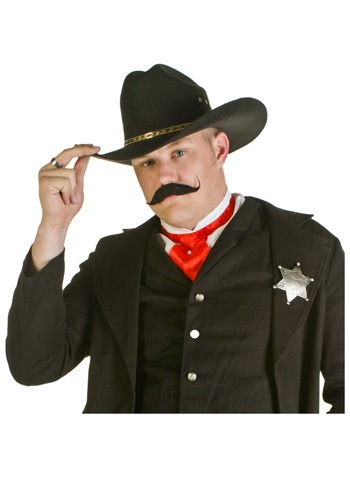 No sinister highway robbers will mess with you when they see this Cowboy Mustache on your face. This dashing nose ornament sticks on without the need for any messy costume glue. It's made of synthetic hair, so no poor cowboys had to shave so you could look cool like them. Just remember: a lot of responsibility comes with a lip warmer like this. Make sure you've got the moves to back it up!